Andrea Layne Black joined Courtney Harrop on the Film and Festival Express to share some conversation and spoken word. Have a listen! Live recording of the Red Jam Slam in Victoria, closing ceremony for the National Campus and Community Radio Conference 2014. 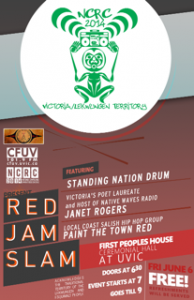 Featuring Victoria Poet Laureate Janet Rogers, Standing Nation Drum Group, and Paint the Town Red. Recorded LIVE at the First People's House, UVic. A small glimpse into SkaFest, Brett Wildeman and Annie Becker LIVE in studio, *RED JAM SLAM* recorded live in Victoria, Atmosphere update, Tanya Tagaq, dubcomandante, Emily Spiller and more! New tunes! Dub Poetry! Ganja Reggae! DUBDUBDUB! !